Well Friends, the time has come to begin bidding farewell to the glorious summer season as July comes to an end this weekend in Athens, GA. The heat&nbsp;may stick&nbsp;around a while longer, but the days of summer freedom are dwindling quickly...&nbsp;so&nbsp;let&apos;s make the most of them! Athens, GA is up for&nbsp;one last fun, free adventurous weekend of July- are you? 1) Veer off the beaten path and take a culinary adventure to Roots Farm this Saturday and Sunday, July 30-31, for the Beaverdam SlowDown Dinner beginning at 7:00 p.m. each night. Discover the source of all your favorite Athens dining. Roots Farm is dedicated to growing fresh and delicious fruits and vegetables through natural and sustainable methods- they aim to distribute mainly to local establishments and to Community Supported Agriculture (kind of like a season pass to the farms produce- pay predetermined amount at beginning of season and receive fruit and vegetables throughout the year accordingly) The Beaverdam SlowDown Dinner at Roots Farm consists of two hour gourmet five course meal prepared by local chefs using locally grown foods, a short tour of the farm, and an open discussion about sustainable farming. 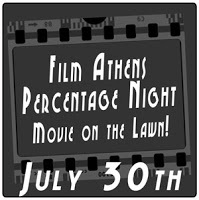 2) Stay up late at Terrapin for a late night tour and movie on the lawn beginning at 9:00 p.m., Saturday, July 30th, for a cause benefiting Film Athens- a non-profit dedicated to supporting and encouraging video production and digital media arts in the Athens community. The percentage night at Terrapin this Saturday night will cost $12, but will include eight ticket vouchers for 4-ounce brews and invitation to view "Planet 9 From Outer Space" on the lawn. So gather your friends and your favorite summer picnic blanket and prepare for lift-off at Terrapin Brewery! 3) Experience the signature sounds of the Athens, GA music scene this Friday and Saturday at The Melting Point with musical events like The 30th Anniversary&nbsp;Reunion of Phil and the Blanks (Friday) and Nomad Artists Present: Bomber City, Klezmer Local 42, and Ken Will Morton (Saturday). Doors will open at 6:00 p.m. for food and drink service, so best&nbsp;show up early and make an entire evening of food, drink, and music fun! If this weekend is approached correctly and fully, saying goodbye to July will be a breeze because summer adventure will have been fulfilled in Athens, GA!